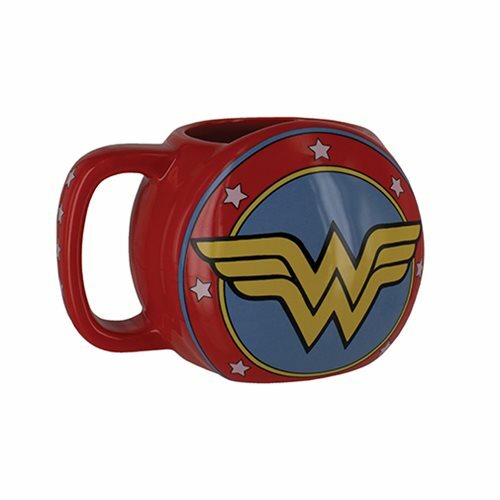 Enjoy a refreshing cup with a superhero in the unique shape of this DC Comics Wonder Woman Shield Mug. Shaped like Wonder Woman's iconic shield, this red and blue hero's mug will help tackle the fight against thirst and give you a perfect tea break. Great for fans of the comic books, films and TV series, the DC Comics Wonder Woman Shield Mug is an ideal gift solution for birthdays, Christmas stocking fillers or even the office Secret Santa. Do not microwave. Hand wash only. Not dishwasher safe.